Laura Gutiérrez was appointed by Governor Walker in February 2017 as Secretary of the Department of Safety and Professional Services. She grew up in Milwaukee and graduated with a Bachelor of Science degree from Carroll College and a Master of Arts in Leadership and Policy from Marquette University. She also completed the District Administrator Licensure Program at Cardinal Stritch University and received her Superintendent license in 2016. Secretary Gutiérrez most recently served as Vice President of Academic Affairs at St. Anthony School in Milwaukee. 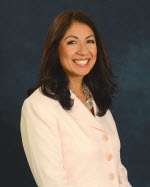 Prior to that, she served as Assistant Principal and Director of Instruction at Bruce Guadalupe Community School. Previously, Secretary Gutiérrez served as an elementary and middle school instructor in various capacities and also worked as a clinical and microbiology laboratory assistant at Waukesha Memorial Hospital. She resides in Wind Lake with her husband George, and together, they have four children. Secretary Laura Gutiérrez from the Department of Safety & Professional Services will join our club to discuss the state of the opioid crisis in the state of Wisconsin.